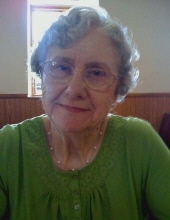 Lucille Alvina (Pettit) Meisenheimer, 86 of Winterset passed away on Sunday, January 13, 2019 at the West Bridge Care Center in Winterset. Funeral service will be at 2 P.M. on Wednesday, January 16th at the Stuart Friends Church (723 N. Fremont St., Stuart, IA 50250). Visitation will be one hour prior to the service at the church. Burial will be at Hebron Cemetery, rural Greenfield. Memorial contributions may be directed to the Lucille Meisenheimer Memorial Fund and sent in care of the funeral home. Online condolences may be left at www.johnsonfamilyfuneralhome.com. Lucille was born on January 22, 1932 to Ed Pettit and Agnes (Jones) Pettit Rudolf at Hebron, Iowa. She was the oldest of seven children living most of her life in Adair County. She attended school in Zion and Macksburg, Iowa. On June 2, 1953 she married John Dallas Meisenheimer in Winterset, Iowa. They raised her youngest sister Janice and a niece, Rosemary and nephew, Mike. They then took in 27 foster children the last one being John Dallas Meisenheimer Jr. who is still in our family. After Johnny graduated she became a long time caregiver to many elderly people. She enjoyed this very much. Dallas and Lucille were longtime members of the Stuart Friends Church where she served in many capacities. Above everything else in life she loved serving her lord Jesus Christ. Her greatest joy was attending church, being with her church family and helping others. She is survived by her brothers: Bill (Joann), Donnie (Lois), Dickie (Betty) and sisters, Joann (James) Lemon, Janice (Bill) Fisher; niece-daughter Rosie (Gary) Barrett; foster-son, John Dallas Meisenheirmer Jr.; sister-in-law, RoseAnn Meisenheimer; six grandchildren; four great-grandchildren; and many nieces and nephews, great nieces and nephews and great-great nieces and nephews. She was preceded in death by her infant son by a previous marriage; husband, Dallas; her parents and step-dad, Clarence; brother, Jerry; sister-in-law’s: Dorothy Pettit, Lois Pettit, Joann Pettit; brother-in-law’s, Bill Wright, James Lemon, Dean Meisenheimer and Ted Meisenheimer; best friend, John Still in later life. He helped her a lot in later life; and nephew-son, Mike McCarthy. To send flowers or a remembrance gift to the family of Lucille Alvina Meisenheimer, please visit our Tribute Store. "Email Address" would like to share the life celebration of Lucille Alvina Meisenheimer. Click on the "link" to go to share a favorite memory or leave a condolence message for the family.